Jenny Jones, meet Ginny Bones, the fashionably thin member of the Bones Family. 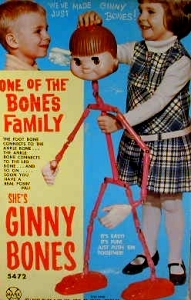 Ginny was made in 1970 by Louis Marx & Co. She stands over 3 feet tall and is comprised mostly of poseable pink bones, much like Mattel's Tog'l people. Her feet are weighted so that she doesn't topple. She has "human" hands and head with molded hair. Marx promoted Ginny Bones as your "real posin' pal". The images on the box show a human boy and girl hanging out with their freshly assembled Ginny, and the back of the box shows Ginny sitting on a park bench with the girl and later, taking a ride in a wagon. Those were some brave kids because Ginny would have scared the hell out of me on Christmas morning. Skinny Bones, Ginny's brother, was another member of the bones family. He was essentially packaged the same (was he made from Ginny's rib?) except that he had the head of a boy. Skinny is even harder to find than the elusive Ginny. The boxes for Ginny and Skinny depict 2 Bones Family animals. Skinny has a horse (name unknown) and Ginny has a dog named Ham Bones. These two critters are even harder to find than Skinny Bones but, like Skinny, usually sell for well under $100.